Joint deformities are possible in any joint of the body, though they are most commonly found in the hands, as the hands contain a large amount of joints that are in near-constant use. Deformities in your joints can have many causes. 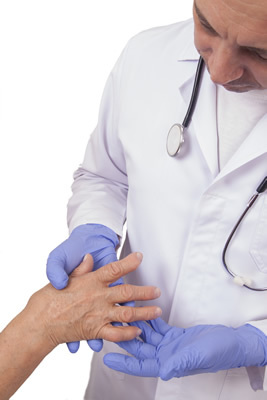 Two of the most common causes are rheumatoid arthritis and osteoarthritis. Below are some of the most common types of joint deformities. Ulnar drift – When one or more finger leans towards the pinky – common with rheumatoid arthritis. Swan neck finger – The joint at the base of the finger is bent, the middle joint is straight, and the outermost joint is bent. Z-shaped thumb – The base joint of the thumb is bent. Hammertoe – A bending of the middle joint, most commonly the second toe. Bunion – Causes a bony bump on the inner (medial) side of of the big toe. Claw toe – The base joint of the toe is straight, the middle joint is bent, and the third joint may be curled. Mallet toe – Causes the last joint of the toe bend downward; most common in the second toe. Valgus deformity – Deformity where the joint bends outward, away the midline. Found mostly in the knees, though any joint can have this deformity. Varus deformity – Deformity when the joint bends inward, toward the midline. Found mostly in the knees, though other joints can also have this. Using common joint protection methods can do a lot to help you maintain joint health and mobility while holding off deformities, arthritis and pain. These can include regular exercise and stretching, avoiding overuse (like typing for too long without a break), and utilizing the strongest joints and muscles for heavier tasks (e.g., carry an object with an open palm, using your forearm to bear some of the weight rather than simply clasping the handle and bearing all the weight in your fingers). Avoiding shoes that are too tight and high heels can dramatically reduce your risk of developing joint deformities in your toes. When a deformity becomes extreme or painful, there are treatments that can be done to help including therapy, medications, bracing, injections, and surgery. Joint fusions and sometimes joint replacement surgery are also considerations. At Orthopaedic Associates of St. Augustine, we will take the time to sit down and discuss every option in detail with you, and determine the best course of action our team can provide for your needs. We are proud to offer the St. Augustine community the most highly qualified team of joint specialists in the area. If you have further questions about joint deformities, you may request an appointment online or call 904-825-0540.